Following last year’s success, local businesses in Boscombe united once again to entertain the public with a diversity of fun, free, and family-friendly activities over the Easter Bank Holiday Weekend. This included the return of a giant 5 m golden inflatable bunny which wowed visitors in Boscombe along with a plethora of events, entertainers and giveaways organised by the Bournemouth Coastal BID. 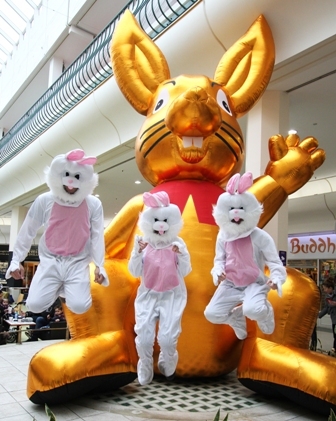 The grand bunny greeted visitors inside the Sovereign Shopping Centre where Shoppers were also sweetened up by a team of volunteers giving out free chocolate between 11 am and 3 pm. Escaping the rain, the centre was filled with people of all ages who came along for the array of Easter activities. Costumed stilt walking bunnies also delighted visitors and entertained the little ones. Children got creative with an arts and crafts competition, where they were challenged to make the most imaginative Easter Bonnets. Over the four-day weekend, visitors were also encouraged to take selfies with the giant golden bunny and upload them onto social media to enter the #GoBoCoast Love Bournemouth Bunnies competition. With a wide range of prizes to be won, including £1000 in shopping vouchers, motivated people of all ages populated social media with fun bunny pictures over the bank holiday weekend. “It was fantastic to see how many families came to celebrate Easter together with the giant bunny in Boscombe and Southbourne. Our brilliant local businesses provided a range of fun activities and tantalizing giveaways that were very well received by both visitors and residents. The Love Bournemouth Bunnies competition challenges people to explore Bournemouth’s coastal areas, enter businesses and find over 100 golden and virtual bunnies. Entrants must take pictures with the bunnies using the free Go Bournemouth Coast app, before sharing them on social media using the hashtag #GoBoCoast. Due to the success of the campaign, the competition has now been extended until the 17th April so that visitors can continue to hunt for bunnies and take selfies throughout the entire Easter school holidays. To download the Go Bournemouth Coast app, visit www.gobournemouthcoast.co.uk.